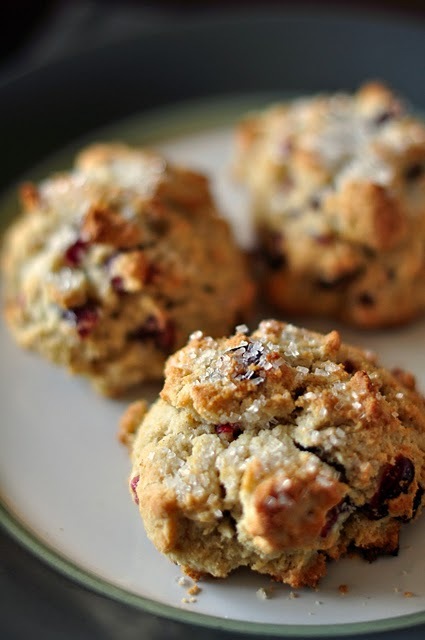 finally, the long anticipated scone recipe is here! it took quite a few tries (10, but who's counting?) until i achieved a perfect balance between taste and consistency on these gems. mind you, depending on what type of flour mix you use, you made need to tweak this recipe to your liking. oh yeah, before you makes these go buy yourself a pastry cutter - using two knives to cut cold shortening into dry ingredients is both a pain and not efficient. its worth the $4 investment at target. the trick to making a light + yummy gluten/dairy free scone (other than using a pastry cutter) is to not overwork the dough. only combine wet ingredients with dry until just combined. when getting ready to place the scones on the baking sheet dont man-handle the dough. i used a 1/3 measuring cup to plop them onto the baking sheet - no dusting with extra flour, no forming into the typical scone shape - let them form an organic shape on their own. trust me, this works! who said scones have to be triangular anyway? - btw swing by Walnut-Ave. + Paisley Passions + Food-Soil-Thread to check out their recipes and projects! to begin - chill palm shortening in freezer. preheat oven to 400 with rack placed in center of oven - line a baking sheet with parchment paper. 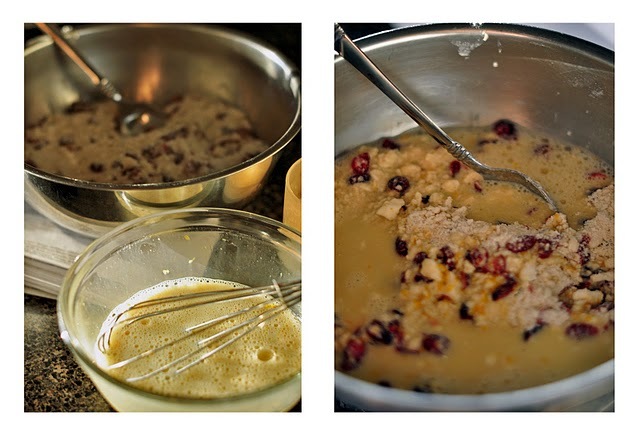 combine gf flour mix, sorghum, sugar, baking powder, guar gum, and salt in a bowl - and whisk together. next, add palm shortening to dry ingredients by cutting it in with a pastry cutter - until the mixture is a coarse meal - the largest pieces should be no larger than pea sized. gently stir in cranberries. in a separate bowl whisk together eggs, vanilla, hemp milk, rice milk and orange zest until frothy around 2 minutes (i did this by hand as you can see below). pour wet ingredients on top of dry ingredients and gently stir until just combined. with a 1/3 measuring cup scoop out mixture and place on a parchment lined baking sheet - spacing scones around 2-3 inches apart - this should yield 8 scones. BEFORE placing scones in the oven let them rest on the baking sheet for 15 minutes. if desired, sprinkle decorating sugar on top of the scones before placing them into the oven. bake for 14-16 minutes - until tops of scones are golden brown and inserted toothpick comes out from center of scone. allow to cool on sheet 2 minutes - then transfer to cooling rack. best enjoyed warm while sitting down, standing up, laying down, etc. Yum, out of all the scones that I've made, this flavor is my favorite. I will be trying Seth's cherry scone w/ out butter soon. That will be interesting. I will now be subscribing to your blog and I can already feel myself gaining weight...oh the pure pleasure of food!